One of my goals for 2015 is to run a 5k…not a mud run, but an actual RUN. I am not a fan of running, which is why I enjoy doing the mud runs; you get to climb over a bunch of obstacles and only have to run in between them. However, I would like to become a better runner and maybe even enjoy it (maybe). Over Christmas I ran while I was at my parents’ house because I didn’t have a gym to use. It was also in the 50s a few days! Only in New England. I actually was able to run about 2.6 miles comfortably, and probably could have kept going! I was surprised at this, since normally I can run a max of 2 miles and that usually happens on a treadmill. I think I have the strength training workouts from the Amanda Adams program to thank for this 🙂 Anyways, I bring this up because I just signed up for my first 5k – the Narragansett Summer Running Festival! It’s not until July, giving me plenty of time to get ready, but I am doing it with a couple friends and it’s at Stonehill College, so I get to run around my old alma mater. And you get a few Narragansetts at the end. Running actually sounds ok if it ends with a few beers! 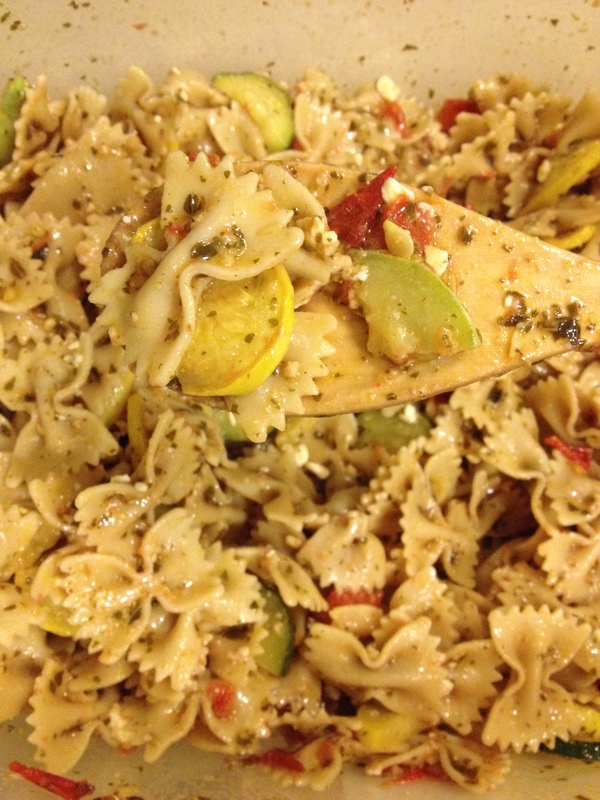 I made this delicious pesto bow-tie pasta salad with fresh zucchini, summer squash, and tomatoes to bring to my friend’s lake house last summer. Naturally, I left it all in the fridge at home, so I ended up having to eat it all myself (I guess that’s not the worst thing!) I never posted the recipe, but thoughts of running outside and warmer days reminded me of it. I’m sure it would be just as big of a hit in the winter time as it would be in the summer! It would also probably be good served warm. Hmm now I may have to whip up a batch again soon…let me know if you try it out! 1.) Cook pasta until desired doneness. Drain and set aside. 2.) Heat oil in a large sauté pan over medium-high heat. Add garlic, zucchini, and squash and sauté 3 to 5 minutes or until just tender. Remove from heat and stir in tomatoes. 3.) In a large bowl, combine cooked squash and tomatoes with pasta, pesto, and cheeses. Mix well to combine and add salt and pepper, if desired. Serve warm or refrigerate until cool and serve chilled. My Favorite Healthy Snacks Under 300 Calories!